Profit Planning | The Markens Group Inc.
Machine Hour Rates and Profit Planning Fundamentals Workshop Fast Facts: Everything You Need to Know About the Workshop! Dates to be determined, Springfield, MA – Please email kate@markens.com if interested in attending the workshop. The Profit Plan is a financial road map for the year. A set of goals for revenue, spending, and earnings, it provides a powerful snapshot of your trajectory for annual growth that will help you to stay on the path to success and increased profits. It may help to think of it as a quotation for a single job, the size of an entire year’s volume, that includes every cost and detail summarized on a single sheet of paper. It is a also guide for a company’s most important benchmarks—not just targets for revenue and profit, but also target markups for materials versus conversion rates and for recouping fixed expenses. • Should I take an order? • Can I cut the price 10% and still make money? • How much does it really cost to produce this job? • Who are my best customers, based on how much they contribute to the bottom line? Profit Planning is based on the principle that determining the cost of an order must include direct (or variable) cost items, or those directly identifiable with the job because fixed costs necessarily involves an arbitrary method of allocation, which clouds the picture. To prove it, ask yourself, “How much rent will this job cost?” It doesn’t make sense when you say it, and it doesn’t make sense to include it in an estimate. A Profit Plan enables you to set targets for your costs, including profit. And if you fail to meet those targets, you will know why. A profit plan also helps pinpoint the areas where potential profit is being drained. Finally this sort of plan will help you to create attainable production standards that will not only make your estimates more accurate, but will also increase morale on the plant floor. If the Profit Plan is a snapshot of the entire fiscal year, Machine Hour Rates (MHRs) are the per hour translation of those goals. TMG can assist you in creating a true out-of-pocket (OOP) hourly cost for each production center in your facility. These rates tie back to the Profit Plan, as does every budget that supports the original plan. Combined with fair and plant-accepted production standards, MHRs help create an estimate that is accurate and has inherent market intelligence that can be used to set target pricing. But creating MHRs that reflect what is budgeted in the Profit Plan is only half the equation. The second element is the time it takes to perform the conversion. Naturally, production standards must be accurate so those responsible for performing to standard at your plant should be intimately involved in their creation. Time and motion studies are not only expensive and time-consuming, but almost always difficult to “sell” to your staff. So TMG’s method relies instead on a mixture of machine capabilities, observation, and plant personnel participation. Make the operators and pressmen part of the process and the estimates resulting from the standards will be much more reliable. All well and good, you say, but replacing my current estimating and budgeting system with something new, even if it offers more information, is going to throw us into chaos. This is why performing a backtest is so important: it is the bridge between the old and the new. And along the way, building it will provide vital information about your customers. A backtest is conducted by re-estimating a broad, representative sample of business booked over the previous six months using the newly constructed MHRs and Profit Plan data. The booked selling price is then compared to the estimate’s out-of-pocket cost, and the resulting contribution is logged and analyzed. But what good are numbers if they don’t teach you anything? The Variance Profit and Loss statement closes the loop from the Profit Plan to the estimate to job closeouts to the traditional financial statement and back again to the Profit Plan. It pinpoints where and by how much any period in the fiscal year fell short of—or exceeded—expectations. Did the plant perform superbly but did we give it all back by overspending? The Variance P&L will tell you. 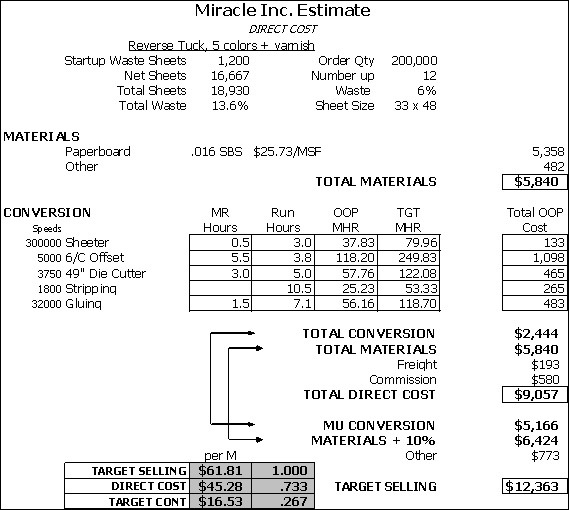 A critical component of calculating ROI on new capital expenditures, Capacity Analysis (CA) tells us how much product you can move through each manufacturing phase. Measuring current throughput against the expected productivity of new equipment is necessary to justify any new purchase and will also highlight existing or potential bottlenecks. For instance, CA can tell you if you should buy a new press that can print 15,000 sheets an hour if you can only diecut 12,000 an hour. Similarly, CA can tell you which pieces of equipment are being underutilized at your plant. TMG can help you run periodic CAs so that you can accept new business without straining other production centers. Periodic CAs also help compare actual throughput to estimating hours so you can determine if you are leaving money on the table or turning down business that could have been run profitably.